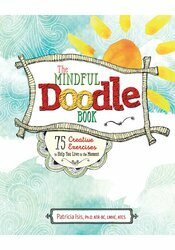 The Mindful Doodle Book: 75 Creative Exercises to Help You Live In the Moment combines the benefits of mindfulness and the intuitive expression of doodling to help you relax, find focus, and creatively express emotions through spontaneous artmaking. Mindful doodling is fun, calming and deeply moving. Grab a pen or pencil and explore the 75 doodle exercises that draw on emotions, thoughts, hopes and sensory awareness. The Mindful Doodle Book is a therapeutic tool that mental health clinicians can use directly with their clients, but anyone can find this doodle book meaningful and useful to navigate a hectic world. Patricia Isis holds a Ph.D. in the expressive therapies with an emphasis in art therapy. Dr. Isis is a licensed mental health counselor in Florida and a registered board certified art therapist, credentialed supervisor and a trained Mindful Self-Compassion teacher. Patricia provides art psychotherapy in the public schools, maintains a private practice, and conducts Mindful Self-Compassion and mindfulness trainings. Patricia is a popular presenter locally, nationally and internationally.